Join artists and designers Natalia Porter and Ben Cohen on a 4-week long adventure in building one of Mexico’s most emblematic watercrafts: the Trajinera, a pre-hispanic Mexican barge. Traditionally used for shipping crops in and out of the fields and on the canals of Xochimilco, these 30 foot-long craft equipped with a dining table and chairs are predominantly now used for the enjoyment of local and non-local tourists. The Trajinera boat has existed for centuries. Today, it is still popular in Xochimilco, a rural part of southern Mexico City, best known for its canals and chinampas, which are the remainders of an extensive lake and canal system that connected most of the settlements of the Valley of Mexico during Tenochtitlan, the capital of the abounding Aztec Empire in the 15th century. Often referred to as “floating gardens,” chinampas were artificial islands, a method of ancient Mesoamerican agriculture. The canals are a vestige of the area’s pre-Hispanic past, which has made Xochimilco a World Heritage Site. To build this Trajinera, Natalia has employed the help of two architecture students at the Universidad Autonoma Metropolitana – Xochimilco, to research the design and construction techniques of these boats. We will be using these plans to build “Xochitl”, our replica Trajinera here in New York. 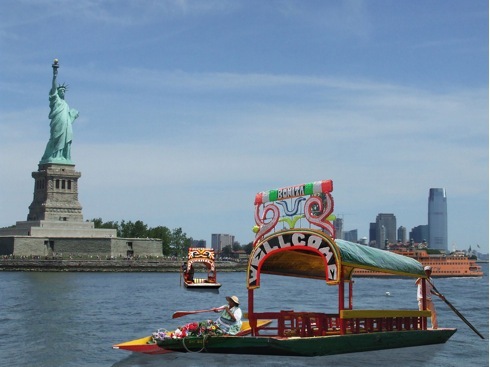 After launching in the Gowanus Canal “Xochitl” will serve not only as a place of cultural exchange, but as a tool and platform for the discussion of different issues, including Mexican Immigration in and around New York City, in partnership with the Mexico Now Festival and the Queens Museum of Art. $65 donation. Sign-ups are available here! It's an all Flux resident crew this month: Curator-in-residence Sam Perry and Artists-in-Residence Angela Washko, Cecilia Enberg, Christina Helena Romirer, and David Spriggs will talk about their recent and upcoming projects. Date: October 19, 7 pm Location: Flux Factory Join us for Collaborative Means, a project that brings together a series of artists working both collaboratively and collectively, relying on cooperative strategies for the realization of ambitious projects. Our monthly potluck and art salon!